After the last cocktail I need something that I know sounds delicious. That in mind, I leafed through my Vintage Spirits and Forgotten Cocktails looking at the cocktails I’d marked to mix at some point. There on page 196 is a picture of a ruby red cocktail that I knew was going to fit the bill. A bit reminiscent of a Negroni, the Lucien Gaudin Cocktail also uses my favorite bitter liqueur, Campari. This has got to be good! The drink is named after the famed fencer Lucien Gaudin who won medals in the 1920, 1924 and 1928 Olympics. I’m ready to start mixing! I can always tell the cocktails I’m only moderately impressed with. They’re the ones that when I get home from work, I reach for a cider or an old standby cocktail instead of my featured cocktail. The Rob Roy was this way. Don’t get me wrong, there’s not a thing wrong with this drink in the slightest. Rather, it’s a very good drink. If you’re a Scotch person over Bourbon then this will definitely fit your palate. For me, each time I mixed up a Rob Roy I was secretly wishing it was a Manhattan. And, there in, lies my problem. But, enough about my problems, let’s talk about this drink. First, the Scotch. I have nothing particularly earth-shattering to share with you here beyond what should, by now, be common knowledge for you all. Go with a Scotch that you really enjoy. I tried the drink with both Johnnie Walker Red and Dewars White Label and found them both tasty. But if you drink your Scotch and sodas with Famous Grouse or a single malt or whatever, then by all means, that’s the one you should use. You already know you like it and, hell, you probably already have a bottle in your cabinet. Second, the bitters. You thought I’d go vermouth, and I will, but first the accent. The bitters, like in any good cocktail play an essential role. For this drink the classic recipes call for Peychaud’s, which is a solid choice. With one caveat. Peychaud’s bitters are truly quite bitter. Go easy with them and you’ll be pleased, go heavy and you might have an overly bitter cocktail on your hands. Third, but interestingly not last, the vermouth. Again, go with what you like. I tried Punt e Mes for this cocktail as I’d never had it before and found it to be great. Deeply complex and just the right level of sweetness. Would I be paying $20+ per bottle to only make this drink occasionally? Probably not. But there again is where you should go with your old favorite. 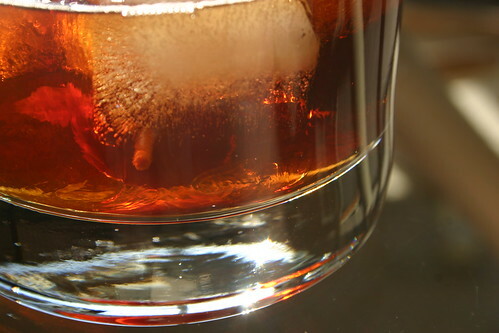 Do you have a sweet vermouth that you really love? Use it! If you don’t, ask a friend, or a local bar, or hell, email me. We’ll get you on the right track. Lastly, a couple final comments on mixing the whole deal up and garnishing. If you’re making a standard Rob Roy, namely sweet vermouth and Scotch, then the garnish should be a cherry. If you have real maraschino cherries (i.e. from Italy) then use those, if not, do what I do. Get a bottle of the radiation burn red maraschino cherries from the grocery store, drain the liquid and rinse them good, then submerge them in the liquor of your choice (I like brandy) until they’re delightful (at least a week). If you’re making a perfect Rob Roy, half sweet and half dry vermouth and Scotch, then a lemon twist is your go-to. Last, but certainly not least, when you mix up this drink, try a different ratio that you’re used to. I tried drinks with both 4:1 and 3:1 (Scotch:Vermouth) and was really pleased with both. It allows the spirit to be the star. When I’m looking for a drink at the end of my day it won’t be a Rob Roy, I’ll reach for the bottle of bourbon every time. But, if you’re a Scotch drinker and you haven’t tried this cocktail, do. You may be missing out on a favorite. I’ve had a rule throughout my adult life that has served me well: Never consume fluids produced by a pornstar. 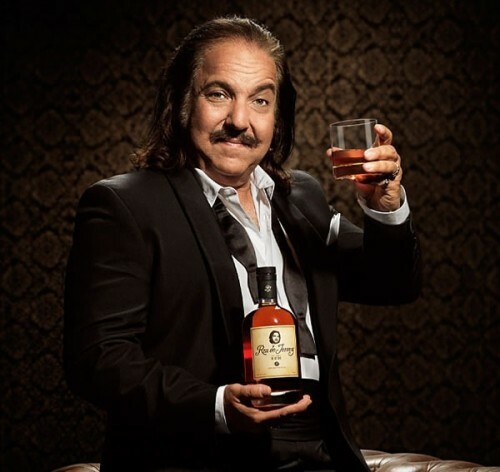 So, when I heard about Ron Jeremy’s new rum, Ron De Jeremy, needless to say I was a bit concerned. The fact that the sample came in a lab sample container didn’t help matters any. But, I figured that it was alcohol so it can’t be that bad for me right? Thus, knowing that my readers needed to know I broke my own rule and sampled it. In this isolated case, Ron Jeremy’s fluids are quite tasty. As expected Ron De Jeremy has a golden amber color. The aroma has notes of vanilla, caramel and the distinct sweet notes that come from a well aged rum. The flavor is quite good, if not overly complex. You get a great blend of vanilla, Christmas spices (nutmeg, cinnamon, allspice), and caramel. Finally, the finish is clean with a medium length. Despite my initial concerns, Ron De Jeremy is a nice aged rum, which is really no surprise. The man behind this blend of seven year old Panamanian rums is well known for his other blends, Havana Club for one. For $30 a bottle you can have your own bottle of fluid produced by a pornstar. Should you need any more convincing, the bottle has a picture of Ron that will look at you lovingly as you enjoy it. I recently consumed my last three bottles of Crispin cider, the Artisanal Reserves, and I’m truly sad to see them all gone. I really enjoyed their vibrant, flavorful Blue Line and the Artisanal Reserves add an interesting mix of depth and complexity. Crispin Artisanal Reserves™ are “Cloudy” hard apple ciders. A completely unique, New World interpretation of hard apple cider. Inspired by the “no boundaries, no rules, let’s give it a go” universe of the superb craftsmen that make up the craft beer fraternity of the USA. The ciders offer unusual taste complexity and authentic cidery aromas, without sacrificing refreshment enjoyment. The Artisanal Reserves use racked unfiltered apple wine, fermented from fresh pressed apple juice, never from concentrate, and smoothed with novel organic natural sugars, such as honey or maple syrup. The unfiltered nature of the apple wine leaves a rich apple sediment in the bottom of every bottle, a true treat in a hurried world, every bottle should have a “Bottoms-Up!” tilt and swirl before opening to ensure even dispersion of the sediment and a fair sharing of the complex flavors. Good to the last drop. Sporting a cloudy, leather brown color this is a cider like no other I’ve seen. Lansdowne has a very complex flavor that lies somewhere between a traditional dry cider and an Irish stout, no doubt from the Irish stout yeast used in the fermentation. Add to that the complex funk of added molasses and you have a cider that really changes your view of what cider is meant to be. This isn’t my favorite cider, but if you’re a fan of stout and cider (Poor Man’s Black Velvet), then this is definitely one to try. Amber in color and cloudy, this cider looks more traditional than the Lansdowne. And as I taste it I can definitely see why they consider this a cider to convert the skeptics. The flavor is very smooth and mellow with hints of the added maple syrup coming through. That light maple flavor blends very well with the apple flavors making for a crisp, bright cider. Excellent cider. I saved this bottle for last and, holy crap, was it worth the wait. This cider has a more traditional look, light amber and slightly cloudy. The flavor, though, is where this one shines. It’s smooth with a very bright apple flavor. The honey is subtle and compliments the sweetness of the apples. I would keep this on hand for myself as a special occasion cider. Something I break out when I’m wanting a cider that’s more nuanced and complex. Definitely my favorite. Now I really can’t wait for Crispin Ciders to come to Colorado some time this year. Going to be a delicious day to say the least.